Jiaaqieats by Jia Qi: Future Fashion Trends in 2015! I love fashion. I love observing how the trends of fashion changes from season to season. One moment this piece of clothing is "in", and the next thing you know, it is "out". It is undeniable that the fashion scene has always been volatile & fast-moving. Thus, it is hard for some ladies to catch up with the fashion trend. Me myself too, I often catch myself wearing old & out of date clothing while others rock the latest trend from head-to-toe. Therefore, to prevent myself from falling into this again, I have been observing the latest fashion trends and I'd like to share these three predictable future fashion trend for the year 2015. 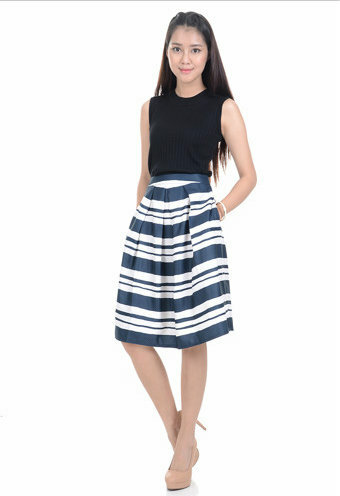 Stripes Midi Skirt that emits a playful vibe. Suitable for a casual day out. Midi Skirts are getting popular among ladies. Midi skirts are definitely a staple in every woman's closet. You can wear a Midi Skirt for almost any occasion without looking inappropriate. You can wear it at work, out on a date, parties and even formal events! Plus, it is so easy to mix & match and style with a Midi Skirt - it goes well with tank top, and even a simple plain t-shirt. Midi Pencil Skirt. Suitable for work or formal event by pairing it up with a blouse. A simple plain Midi Skirt. Pair it with a blouse for a more formal look ; Pair it with a tee or tank top for a casual, chic look. The Tulle Skirts are climbing in percentage since last year and could be one of the top choices women choose as part of their outfit, as it gives woman a sense of feminine & princess-y feel. The puffy A line skirt definitely exposes a woman’s girl character effortless. Tulle skirts are great to be worn to parties, dinners or even a date with the special someone. You can also pair a Tulle Skirt with a denim top or a biker jacket to have an edgy feel too. Wanna be stylish & feel comfortable at the same time? Jogger pants is your answer! Jogger pants are being push into the limelight in the world of fashion due to its comfortable fit. Purple jogger pants, heels, white crop top and white blazer. A stylish look yet you don't need to leave your "comfort zone"
And yes, you can look chic & stylish even though the jogger pants are so comfortable! Just pair it with a pair of heels, a crop top and finish it off with a blazer to give yourself an edgy look. The jogger pants also comes in different colours & patterns, and it is easy to pull off a casual look with it.